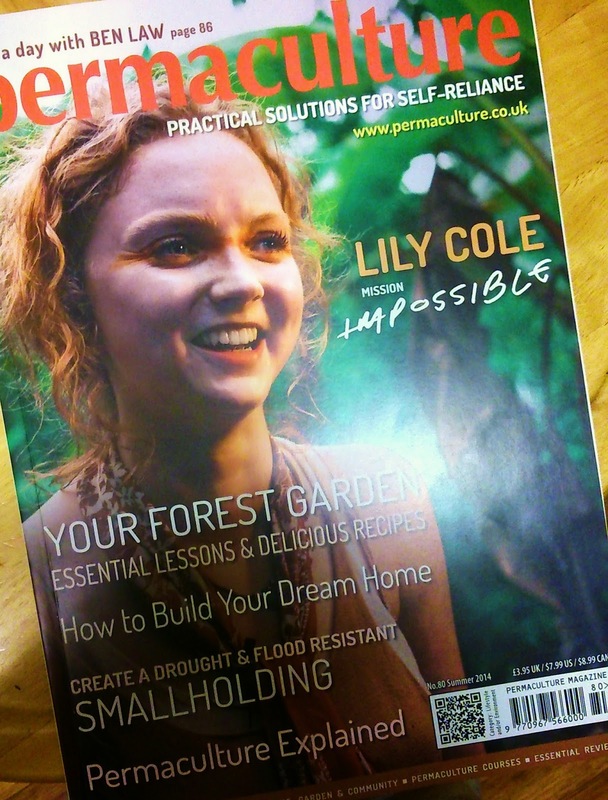 Permaculture Magazine is a substantial quarterly magazine packed full of all things permaculture-related. From global politics, climate science, food growing methods, resiliance and sustainability to crafts, off-grid living tips and recipes, every issue is bursting with colour and inspiration. I feel the magazine is accesssible and informative and I'm very happy to have contributed an article to PM80, the Summer 2014 issue. 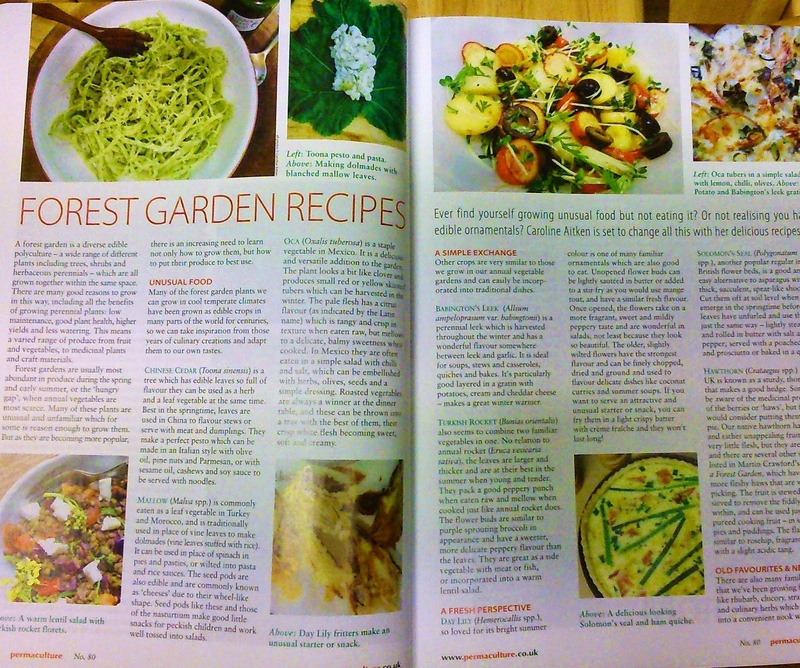 I have offered up a few favourite forest garden recipes, some of which are featured in my book Food From Your Forest Garden plus some advice on choosing which plants to grow in your forest garden and how to make use of them. 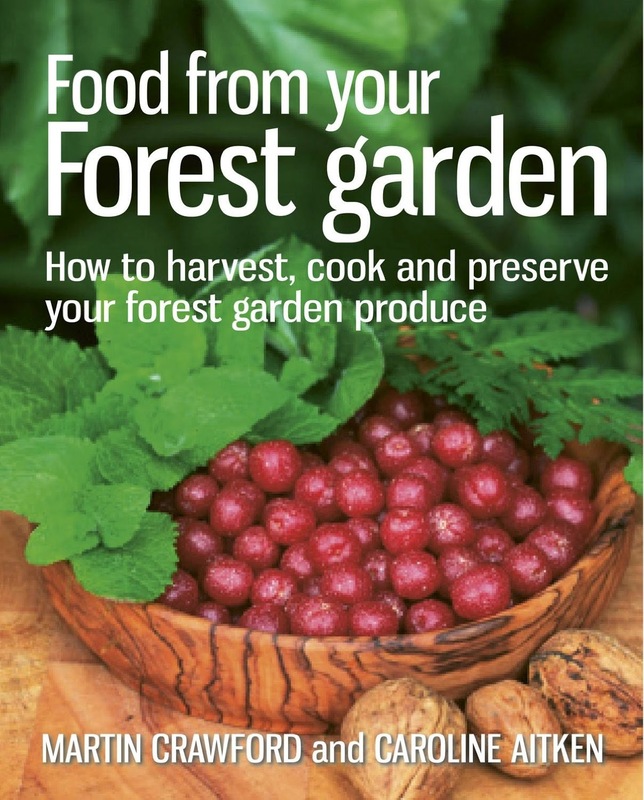 "Forest gardening is becoming more and more popular, and although it’s sometimes confused with other things, such as foraging, interest and understanding is increasing in this very different way of growing food. A forest garden is a diverse polyculture – a wide range of different plants including trees, shrubs and herbaceous perennials, which are all grown together within the same space. There are many good reasons to grow in this way, including all of the benefits of growing perennial plants; low maintenance, good plant heath, higher yields and less watering. This means a varied range of produce from fruits and vegetables, to medicinal plants and craft materials. Forest gardens are usually most abundant in produce during the spring and early summer, or the ‘hungry gap’, when annual vegetables are most scarce. Many of these plants are unusual and unfamiliar which for some is reason enough to grow them. But as they are becoming more popular, there is an increasing need to learn not only how to grow them, but how to put their produce to best use." Take the apple mint leaves and push them into a measuring jug. Pour over the boiling water and allow to steep until cool. Blend the wineberries in a food processor or liquidiser until pureed. Pour the puree through a sieve into a bowl and discard the seeds and pulp left in the sieve. Strain the mint leaves from the water and add the water and sugar to the wineberry juice. Stir together well and transfer to a plastic, freezer-safe storage container. Check the sorbet periodically and remove when it is semi frozen- solid at the edges and slushy in the middle. Whisk the egg whites until it forms stiff peaks. When the sorbet is semi-frozen remove it from the freezer and add it to the egg white. Whisk together briefly and return to the container, and then to the freezer. The sorbet is ready to eat once it is completely frozen, but you may want to remove it from the freezer 10-20 minutes before eating so it is easier to scoop. Decorate with apple mint leaves and serve.